A solution for a bug that lead to strange artifacts appearing on pictures sent through Share Sheet. Additionally, iOS 12.1.3 addresses 2018 iPad Pro bugs that resulted in audio distortion when people made use of external input audio devices. Previously, this bug was spotted in the beta versions of iOS 12.1.2, but has been delayed to the latest release due to the iPhone-exclusitivity of previous updates. Two HomePod bug fixes are also present in the iOS software update. iOS 12.1.3 addresses a matter that might make HomePod restart as well as a problem that might make Siri stop listening. Additionally, there’s a good chance that iOS 12.1.3 contains a range of fixes and security patches. More details can be found on security for various releases of Apple through different contents. 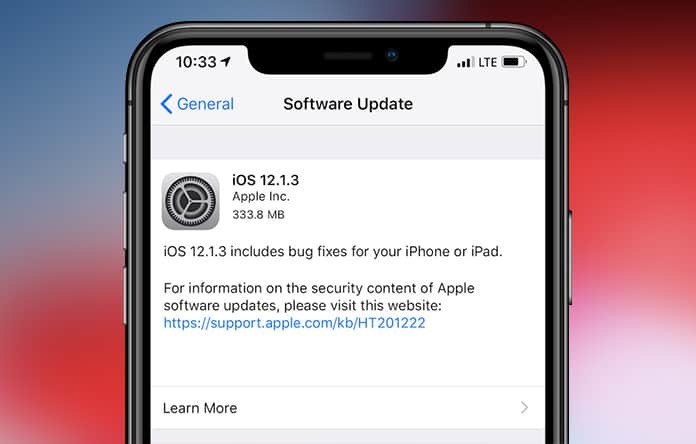 The latest update of the software follows the introduction of iOS 12.1.2, which was released ahead of schedule to address things that were infringing on patents of Qualcomm in China. Itself, iOS 12.1.2 was a random update. It was released after a single beta version and two the software update’s two builds were released for no particular reason. The last iOS 12.1.2 release was also limited to iPhones. Interestingly, iOS 12.1.3 first version was labeled as a second beta, as most of its content was similar to iOS 12.1.2. But with this new release of iOS 12.13, the iOS schedule seems to have returned to normal. Where to Download iOS 12.1.3 From? iOS 12.1.3 should be now available as an OTA (over the air) download. You can update your firmware from iOS 12.1.1 if you’re using iPad, and iOS 12.12 if you’re using an iPhone. Find it in Settings – General – Software Update. Did you updated to iOS 12.1.3? Do you liked it? Please share your thoughts in the comments below.